That was the text message I got from my fishing partner Rich early on Super Bowl Sunday morning. It was a beautiful winter day with high temperatures expected to be in the 40s. Winds were light, skies were clear, and a new moon was pushing swift tides up the Chesapeake Bay. There was no reason to postpone our usual Sunday afternoon fishing trip, right? Well, no reason except for the 75 miles of ice clogging our waters. 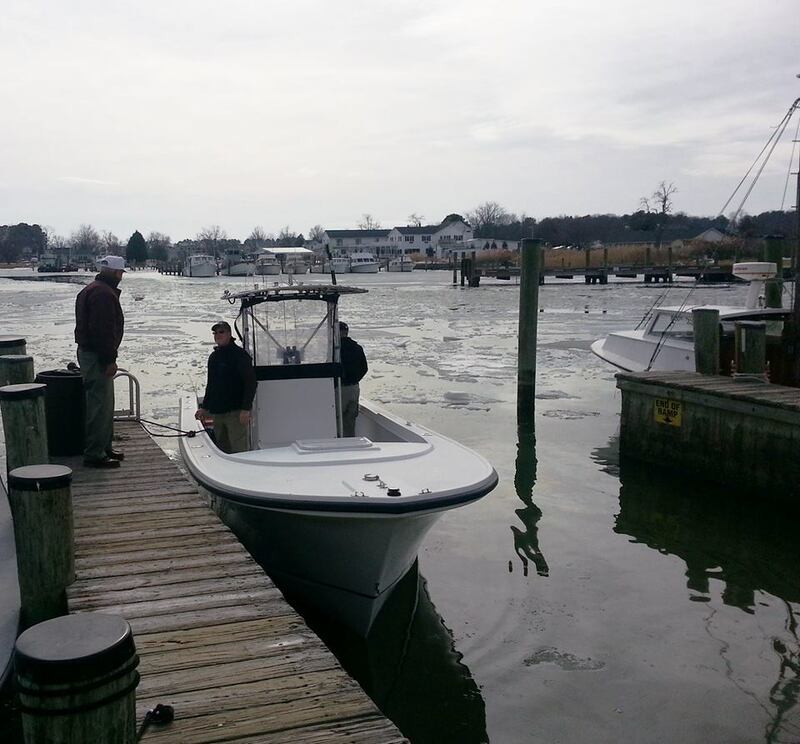 It’s been a cold winter so far on the Chesapeake Bay. The Bay has frozen all the way across at the Bay Bridge on a couple of mornings and the Eastern shore has been iced in all the way up from Taylors Island to the Susquehanna Flats. The weekend warm-up had loosened up some areas, but almost all the Eastern Shore ramps were still packed in solid. We hitched up my 27′ Judge Center Console to Rich’s truck and headed off toward Easton. In less than an hour we had picked up Jamie, blazed through the nearly deserted tourist town of St. Michaels, and rolled across the Knapps Narrows drawbridge. Even though I’ve been to Tilghman Island dozens of times by boat, I’ve never launched there. I had guessed that the boat ramp would be near the drawbridge in the Narrows area. I spotted a fellow walking out of a little store and asked him if he knew anything about the ramp. He told us to follow him because he was going that way. We pulled in behind his well-traveled pickup and trailed him all the way to the public ramp at Dogwood Harbor. It turns out there’s a trick to backing down to the water at this ramp. It’s too narrow to turn a boat and trailer around, so you have to first pull into a little side street and back around a couple of 90-degree turns to get your boat in the water. Fortunately, our guide was gracious enough to explain the procedure and show me how to launch. Our Good Samaritan turned out to be one of Tilghman Island’s most famous citizens. He was none other than Wade Murphy, the owner and captain of the oldest working skipjack on the Chesapeake Bay. Since Jamie is the son of a well-known Eastern Shore waterman, he struck up a conversation with Captain Murphy right away. Rich had also met him at some area flea markets, so they had plenty to talk about. As another guy walked up to join our circle, the conversation eventually came around to fishing. Someone asked Jamie where we were headed. With his typical flare he replied, “Wherever we can find the fish.” We all laughed, especially Murphy. I believe that’s the answer the captain expected. Unfortunately, a quick glance at the harbor told us finding the fish might not be easy. 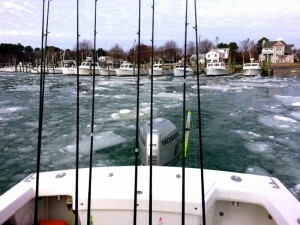 Even though a few boats had been out, there were large chunks of ice everywhere. 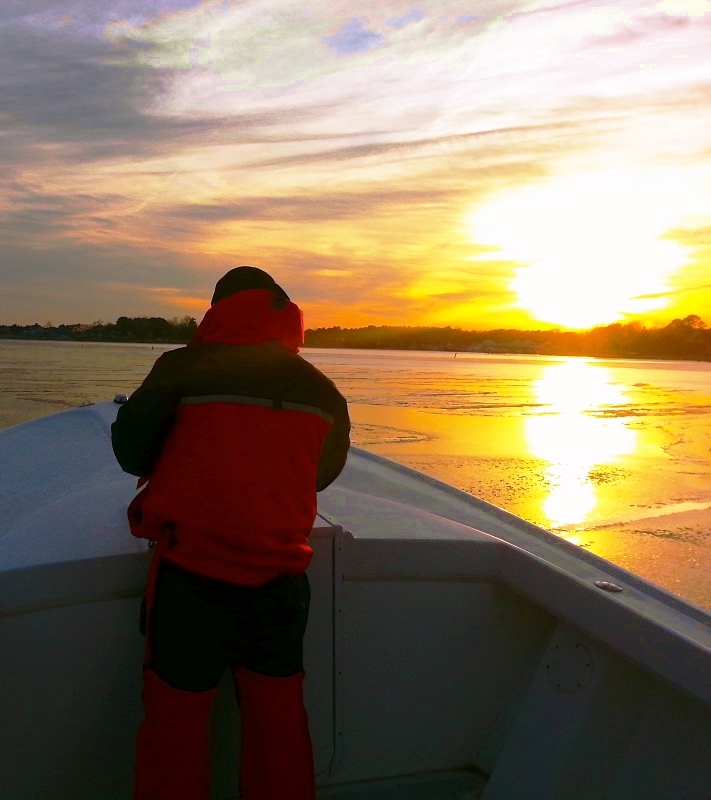 I grew up in the south where the winters are milder, but I’ve had my share of experience boating in the ice. As a teenager, I worked at docks where the freshwater coves would freeze occasionally. I learned early on that a steep deadrise, even on a fiberglass hull, will shed ice just as easily as it will water, as long as you maintain the proper speed and angle of entry. Big ice chunks are a different story: you just have to miss them. Clipping a big ice chunk with the side of a fiberglass boat is a sure prescription for gel coat repair. With two spotters on board, I thought we had a fair chance of getting through the big chunks and out of the harbor, so we gave it a shot. Dodging the ice was tough. In some places it was easier to break through the softer 1- to 2- inches of skim ice than to navigate around the thicker pieces that had already broken up. We carefully blazed our own trail for a few hundred yards and eventually found clearer water where we could run a little easier. Before long, we were fishing. a picture, but I managed to get an action shot of the fish in the water. Overall, it’s been a slow winter for catch-and-release striper fishing. We’ve had some good days when my fishing partners and I have released several nice rockfish, but it’s a lot slower than it’s been in the past. Every detail matters when you’re chasing big wary stripers who have seen their share of fishing lures. 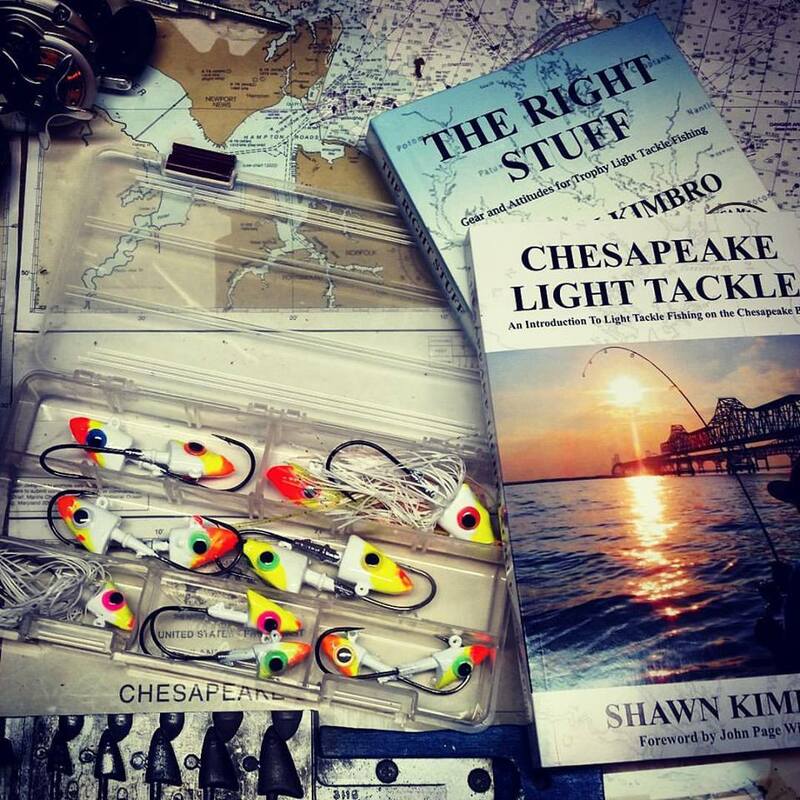 In my book, Chesapeake Light Tackle, An Introduction to Light Tackle Fishing on the Chesapeake Bay, I outline many of the strike triggers that add up to making bad days good, and good days great. It’s easy to catch fish when they’re hungry and ready to bite, but on days like last Sunday, we had to pull out all the stops. We quit early Sunday since we needed to navigate back through the ice while there was plenty of daylight. As luck would have it, a south wind and a strong incoming current had pushed the ice around making it tough to get back in through Knapps Narrows. We had to maneuver slowly and carefully, sometimes around chunks as big as semi trailers. Despite the difficulty, the Eastern Shore sunset reflecting off the ice was beautiful. We were back at the ramp and had Thunder Road loaded on the trailer before dark. I crawled underneath to take a look at the hull. As expected, nary a scratch. With more bad weather predicted this weekend, it looks like fishing will once again be limited for awhile. Fortunately, there is still plenty of open water in the sheltered Western Shore rivers. 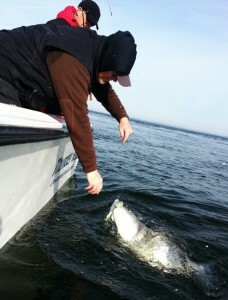 Successful striper fishing right now is all about finding warmer water. Remember: any source that emits water that is warmer than the ambient temperature of the Bay will attract stripers in winter. This can be any industrial source or even natural ones such as sun-warmed water coming out of a drainage ditch. 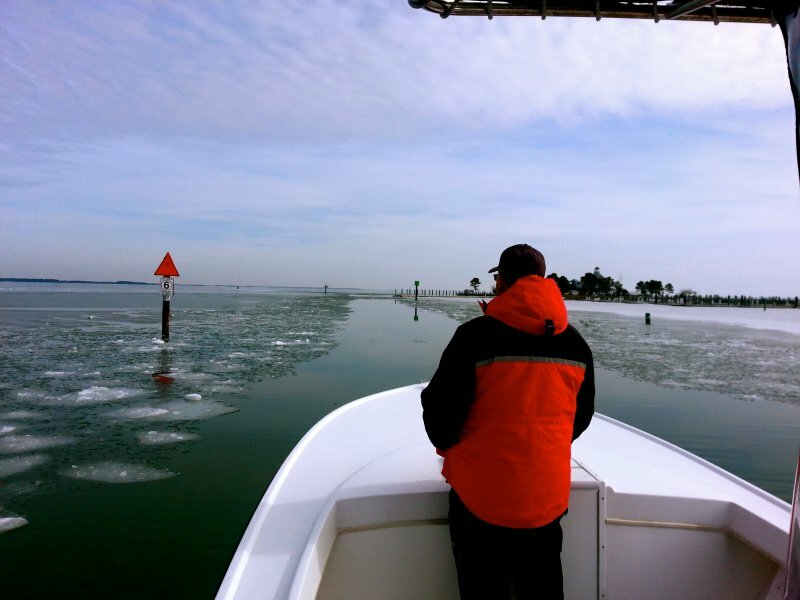 With the exception of the Bay Bridge area, the well-known winter places where fish (and fishermen) usually concentrate just aren’t producing. 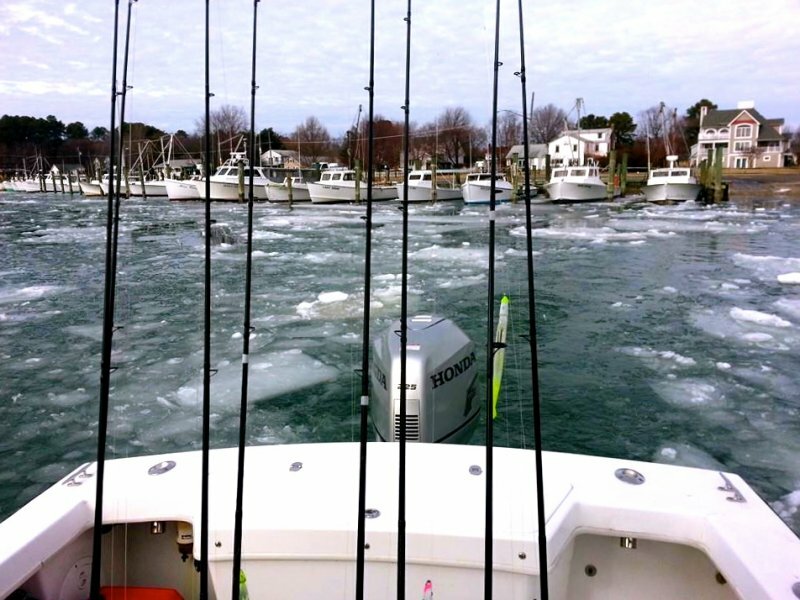 While I don’t recommend ice-breaking with a fiberglass boat, there are fish to be caught out there for those who are up for the challenge. To get finicky winter trophy stripers to bite, you have to think out of the box, go the extra mile, and use all the strike triggers in your light-tackle arsenal. Good luck and stay safe! Shawn, as always another great report with awesome pictures. You are one Die Hard FISHERMAN..
Dang near felt like I was there,minus the cold.Great read,Shawn. Sorry the fish were not there for you and and crew,better days ahead ,I’m sure. wow, great effort guys. glad u all got out. I am getting cabin fever. boat is right there, but water is frozen. don’t see getting out for some time. oh well. wtg. thx for pics/rpt. Gerald and I had some ice breaking adventures a few years ago in my C-hawk…the first couple times was kind of spooky… This report brought those moments back to life… Good read once again. For me I just put the bow up and rode on top ’til the ice broke… never damaged my boat doing that… killed it a hundred other ways though. I completely get that plaining out on the ice technique, Joe. I’ve done that too. Had a video up for awhile of just that scenario but I think some people thought I might be promoting a dangerous situation so I took it down. They’re probably correct, but c’mon… we gotta fish, right? Yea I can see how some people would take that to an unsafe limit… I suppose if a person got all “Cowboy like” an ran too fast their boat could end up high a dry on the ice… I just want to see some normal winter temps to finish out this cold season. Shawn, Just catching up on reports. Nice there buddy. To be honest I love trip like that. Seems paying a price only make ever fish more sweet.